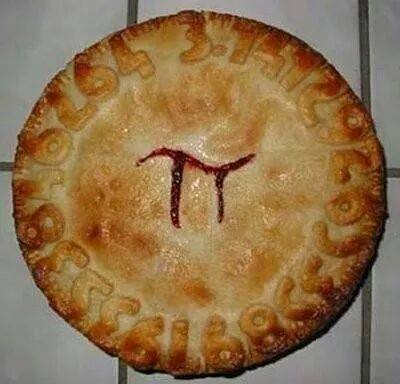 Today is Pi(e) Day. How will you celebrate? I am in Los Angeles, California where I believe pie is still made… somewhere. I am off to find. I know I am tired when I tear up watching my old videos of going to Carl’s Jr in Glen Innes and the New Zealand National Anthem in St. Heliers. People are dumbfounded when I say I am homesick for a place I lived in for just over 5 months. And some family and friends do not want to hear it because they like me living in Davis, not Auckland. Today I am just plain homesick for the land of the long white cloud. One cause is my recent lovely, lovely 4 day adventure in Los Angeles with UK Sarah. She was flying from London to Auckland and broke her journey in L.A. I flew down to meet her. It was magical. Just as I imagined we talked non-stop for all our waking hours. I thoroughly enjoyed being a tourist with Sarah. Her wonder at the Hollywood sign and the Pasadena City Hall and Olvera Street helped me to see them all again with new appreciation. We did so many things and yet we did not overdo. There was an ease to our agenda. Nonetheless, we did tick a lot of boxes: Pasadena, All Saints Church, Huntington Library and Garden, Union Station, Chinatown, Disney Music Hall, USC campus, the Coliseum, the hood, the Grove and Farmers Market, breakfast in Santa Monica, fab knitting store (Compatto’s), the Getty Center, the Beverly Center, Rodeo Drive, Beverly Hills, Hollywood Walk of Fame, a red carpet event where we saw Billy Crystal get out of his limo and wave. Here’s to 2 Pretty Women. 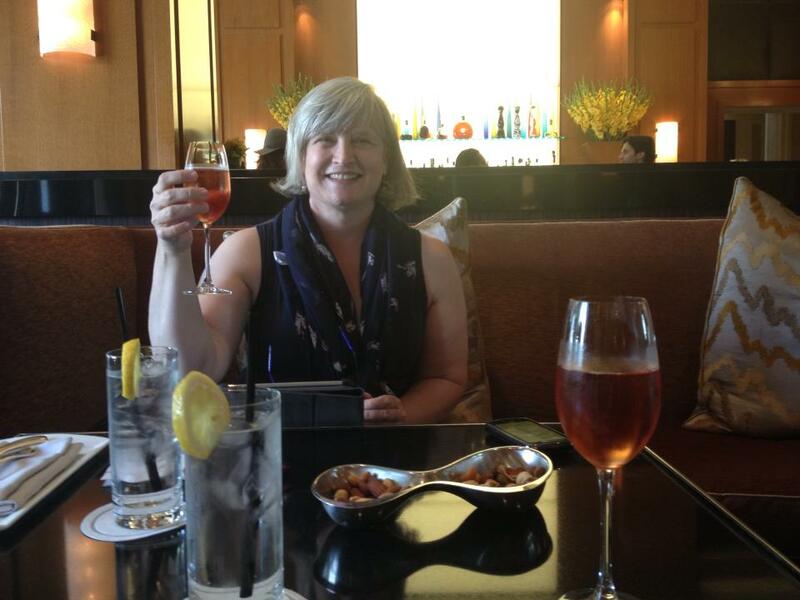 One of my favorite stops was at the Beverly Wilshire Hotel. I did not know this is where Pretty Woman was filmed until Sarah shared it with me. She was tickled pink to snap pictures of the lobby, the front of the hotel, of me drinking champagne in the middle of the afternoon. We stepped out the front door of the hotel and saw this amazing car with all kinds of people tripping over each other to take a picture. So I asked “what kind of car is it?” and no one knew. I did my best imitation of Julia Roberts’ laugh and emailed a picture to Tevis and Marcos. 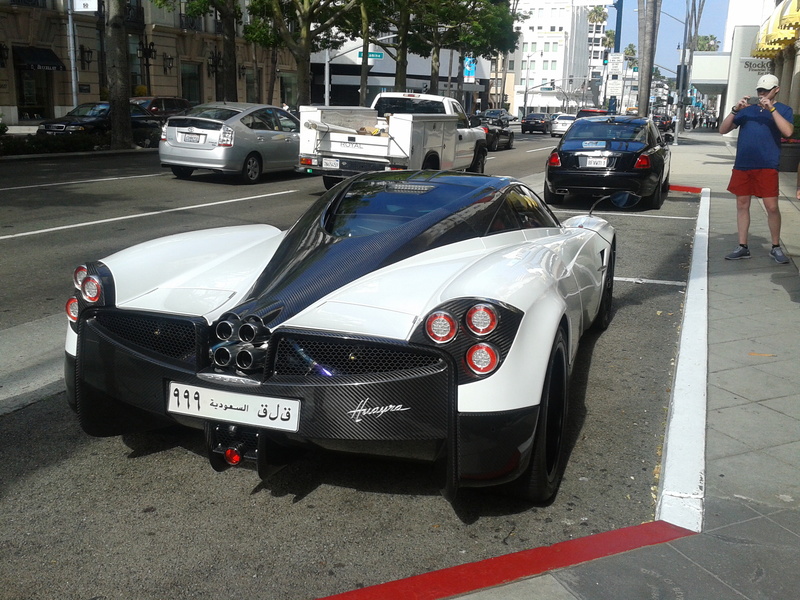 My new son-in-law emailed back: Pagani Huayra. An Italian sports car company. I only know this through Top Gear haha. Anybody have upwards of $1.3 million to spare?! On our last day we drove to Pacific Coast Highway and started at the Topanga Canyon Beach and then worked our way down the coast line stopping at the Santa Monica pier and in Venice for lunch. 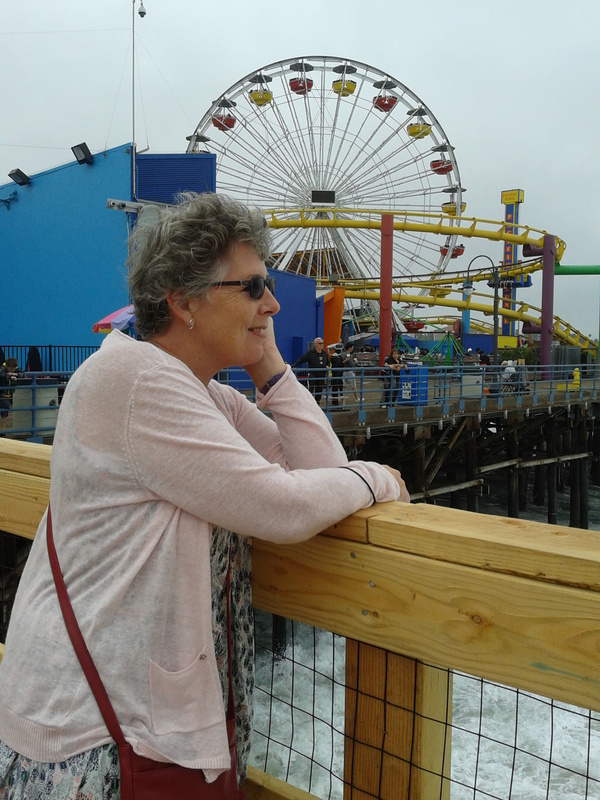 Sarah’s guidebook suggested avoiding Los Angeles this time of year because of June Gloom (see photo backdrop). The sun was hiding, yet it was not cold, and we enjoyed ourselves immensely. The big surprise for me was Venice. 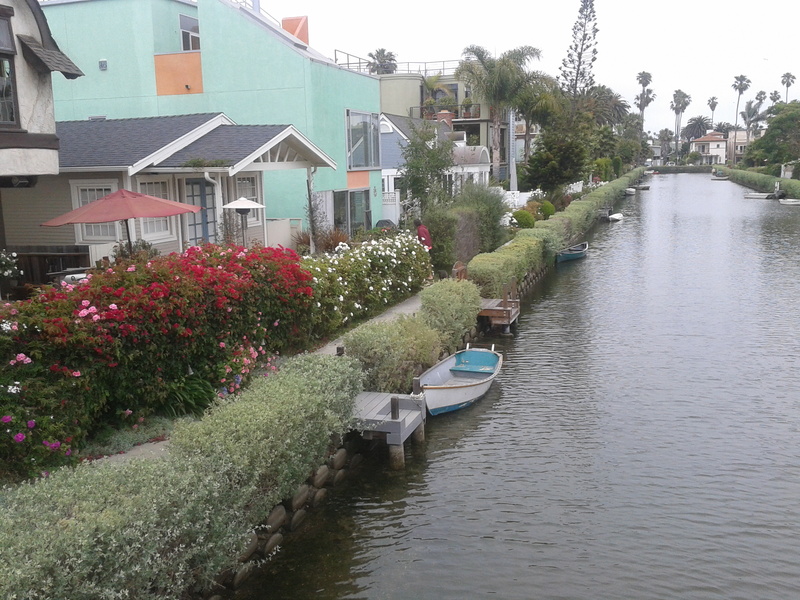 I have never spent much time in Venice, California. Sarah and I agreed that we did not want to see Muscle Beach. She had read about the Venice Canals and we decided to find them instead. Along the way we thought about lunch and I suggested Mexican food because it was her last day and we had yet to eat any (like going to Italy and not having spaghetti). We plugged in “Mexican food” and “current location” to Yelp and an unassuming place very close by on Rose Street with 4.5 stars popped up. La Fiesta Brava was authentic and delicious. We pushed tables together to accomodate a local, Donna, who arrived stressed out from work and left refreshed from our shared conversation. Plus she treated us all to a beer. We did eventually find the Canals–they are so very cool. Restored in the mid-90s, they offer a unique lifestyle. We could imagine ourselves enjoying a glass of Sav on the deck, sharing a cheese platter with our neighbors. Another life perhaps. Or on another visit. It was with a heavy heart that I said farewell to UK Sarah at LAX. I will see her at the end of September when I next visit New Zealand. I also struggled with balancing my work life with vacation. I had to take a few phone calls while in Los Angeles and part of me was thinking, “Oh no, backsliding on my redesign.” Part of the pressure was self-induced because of a meeting that went poorly just before I hopped on the plane to Los Angeles. I could not shake off the bad vibe. 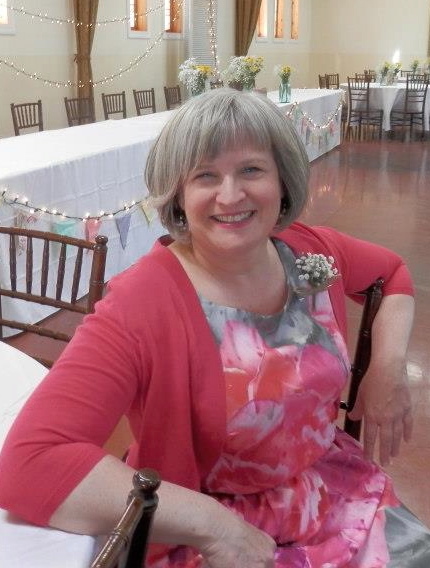 After I got back I got some great coaching from my friend Connie who helped me gain perspective. Next time, when something like this happens, I am going to call her and ask for help ASAP. I did have some down time this weekend to reflect on my creative life and what I want to do with my love of writing and passion for travel. I have some ideas and I will share them when they are more developed. In the meantime, I know that I love New Zealand so much because when I travel I open myself up to serendipity, to the magic of meeting new people and experiencing things from another perspective. It inspires me and leaves me wanting more. I experienced it again in Los Angeles of all places. A place that I lived while at University, and somewhere I have done the “up and back” on Southwest Airlines so many times for work that I did not believe it could surprise me. Next up: Norway and France with Tevis in July.